This home was originally located at 45 Ballardvale Road and was moved to this location by Michael Ristuccia to save the home from demolition. 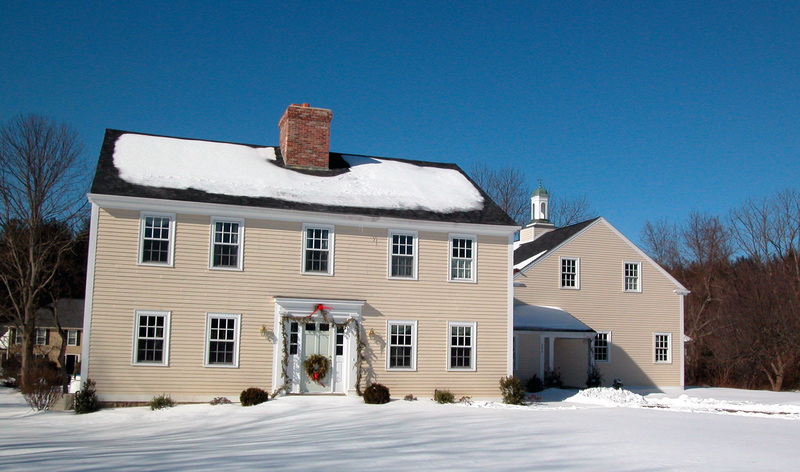 This home and property became the catylist for Andover's Special Dimensional Permit process for saving historic properties. Once on an original land grant from King George III, the Abbot farm originally extended from the Reading Road (Main St) to Woburn Street and was in the Abbot family for nine generations to pre 1920's. There were extensive flax fields and houses were built with lumber from the farm. The present house, was built in 1825 and was the third one on the farm. The first house sheltered Acadians. Jonathan Abbot had built a second house across the road in 1756; twenty-two Acadians from Nova Scotia were brought to Andover. The families of Jacques and Charles Esbert stayed in the first house, then vacant, of Johathan Abbot. These were the first Roman Catholics and foreigners in Puritan Andover and they were not received with enthusiasm. However, their diligence soon won them friends here and when they moved on to settle in Springfield, they were missed. Asa Sheldon, a Wilmington farmer wrote of being hired out to work for Capt. Stephen Abbot in the spring of 1811. Evelyn and Henry Jenkins were later owners in 1940's. Mrs. Jenkins found religious artifact in her garden, probably brought from Europe, 1743 (by French Canadians?). Indian relics also unearthed here with spring of water, indicating site of Indian village. Major Alterations	January 2002: removal of central chimney and summer kitchen in basement associated with moving the building; Owner Michael Ristuccia restored both during renovation; completed 2006. The home sat on the corner of Ballardvale & Sunset Rock Road. The new owners of the property had no interest in restoring the period home. It was hoped at that time that the home could be moved just west of its original location by sub-dividing the property. The land was just a few hundred square feet shy of creating two conforming lots, and the project was denied. Michael Ristuccia, an Andover native and contractor, purchased the home, dismantled the center bay of the house and moved it in two sections to his property on South Main Street. Ristuccia lived in and restored the Holt house next door at 373 South Main. Major Alterations 2006 - 2007 moved from 45 Ballardvale Road. 1/2002 removal of central chimney and summer kitchen associated with moving the building. Owner to restore both during renovation, scheduled 2004-05. Move Details Feb. 24, 2002 moved from 45 Ballardvale Rd.